Do babies even need toys? Newborns do not actually need toys, since sleeping and eating are really their main interests. But around the 3 month mark, many parents see their babies “wake up” and become more interested in the world around them; this is a great time to introduce them to fun toys and activities to keep them entertained. Which kinds of toys should babies play with? Realistically, babies are happy playing with household items like wooden spoons and plastic food containers, so you shouldn’t feel overwhelmed to break the bank on toys. The best toys for babies have colorful contrast for developing eyes and and engaging textures for little hands. And because babies do tend to explore the world by placing new items in their mouths, all toys should be safe to chew on. We suggest registering for at least a few fun and bright toys that will come in handy to distract a fussy baby or make tummy time more enjoyable. Whether you are looking for simple hand held toys for play time or soothing amusement for bedtime, we have a variety of great picks for you to choose from. 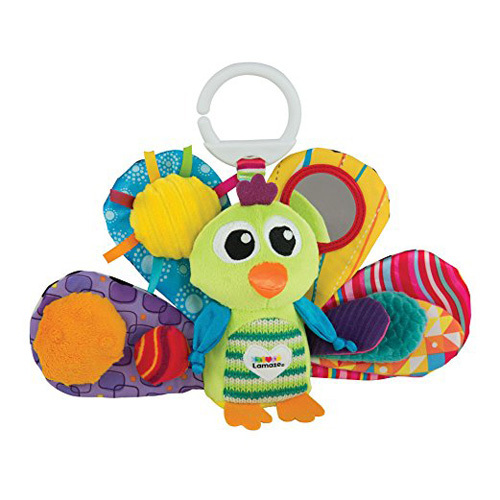 This colorful looped grab toy is the perfect size for little hands and has a gentle texture for young ones to gnaw on. It can even be refrigerated to a cool temperature to soothe sensitive teething gums. Although it’s simple, many parents find their babies mesmerized by the rattle and colors. It’s also lightweight enough to play with from an early age. 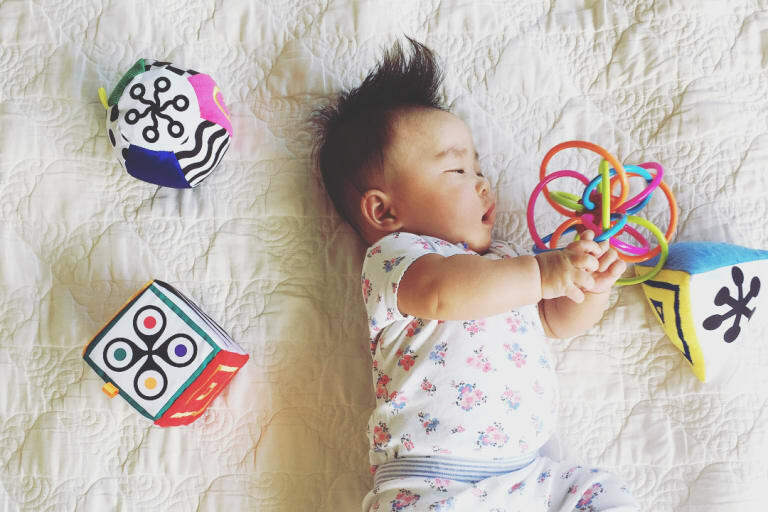 “My baby has loved the bright colors from the start!” -Esther M.
We love Lamaze toys! All their toys are made with a baby’s sensory development in mind. Jacque the peacock features a colorful design, distinctive crinkly feathers for stimulation. Jacque also features rattle sounds and a clip for on the go traveling. This plush octuopus plays a differnet musical tune for each tentacle. The sweet facial expression and variety of colors helps your little one learn how to focus for healthy eye development and coordination. It also comes with a color-coded song book that your baby can read as they grow older. Skip Hop’s cute little shakers come with an owl, hedgehog and fox that make original rattle sounds. Each character has a different textured belly for little hands to grip and hold and we love Skip Hop because all their products are made phthalate free. With bright colors and distinctive textures these rattles are sure to stimulate your baby’s senses for healthy auditory and visual development. 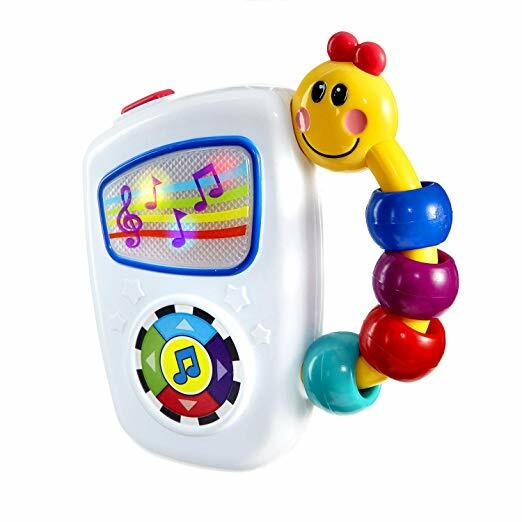 This may look like a cartoon version of an iPod but babies really do love this musical toy. Your baby will hear versions of classical Mozart, Vivaldi, Chopin and Rossini along with bright lights and colors. Plus, it’s a great size to throw in a diaper bag and your little one can hold on to it by it’s caterpillar handle. “The songs are longer than other toys so you can sing along with them to your baby…It’s one of her favorite toys and we bring it everywhere.” -Lisa B. “I could not survive a car ride without it. Apparently other mommies agreed because I received 3 for my shower! I used them all!” -Nicole A. This traveling toy comes with an adorable cloud that shakes and vibrates when the handle is pulled by your baby. With many elements to engage with including rain, a star and sun your baby is sure to keep entertained while in their stroller or carseat. It’s a great, quick distraction for on-the-go families. This simple concept soother is a plush stuffed toy attached to a Soothie pacifier. The easy-to-grab animals come in different options like elephant or giraffe, and even if your baby doesn’t like a pacifier, some like to chew on the soft rubber section. Since pacifiers are small, they notoriously get lost when flung out of a crib. But the animal part of this soother makes it easy to find and keep up with for routine nap and bedtimes. “These are wonderful for little ones because it allows them to develop their motor control skills, AND it’s sooo much easier to try to find [and] replace a pacifier in the middle of the night when it’s attached to an adorable stuffed animal! ”-Adrienne S.
“We don’t encourage the pacifier but when he needs it, this one is great. It never gets lost, his little hands can easily grab and hold it.”-Felice P.
Getting your newborn to sleep can be a challenge, and this sleepy lamb is a wonderful sleep-aid for your baby. With eigt soothing melodies and white noise sounds, this is sure to be a favorite bedtime toy. Plus, a scientific study about this toy found that babies fell asleep within five minutes in response to the Sleep Sheep. “I thought this toy was trendy fluff, that the only reason people bought it was because everyone else was buying it. But from the minute we pulled this out for our little boy, he and Sophie are inseparable…Sophie is the real deal!” -Lindsay B. “There’s something about those spots, that little face and those hooves…my baby is obsessed.” Jenna B. While toys aren’t a necessity for your new little one, they can still be a lot of fun. And friends and family love to buy cute, memorable toys off your registry. Depending on your budget and style, pick one (or several!) that will be part of many happy times ahead!